Lency Delgado’s ninth home run of the year gave Doral a 3-2 lead. For the second year in a row, the Doral Academy Firebirds defeated the Westminster Christian Warriors in Friday’s HSBN Miami-Dade Game of the Week. The Firebird offense exploded with a five-run rally in the bottom of the sixth inning to lift the hosts to a 6-2 victory. The comeback started with Lency Delgado’s two-run home run to give them the lead, after Doral (13-6-1) entered the inning trailing 2-1. The victory did not come easy for the Firebirds, as Westminster starter Jamar Fairweather brought his A game for the Warriors. Same can be said about Doral Academy’s starter Jorge Perez who, despite being pulled in the fifth inning, matched Fairweather’s dominance on the mound. Both offenses were quiet early on. Westminster threatened in the top of the third when it had runners at the corners. A wild pitch would have scored a run, but Firebirds’ catcher Salvador Alvarez recovered the ball quickly and threw out the runner at home. Roberto Leiva had a 3-for-3 day in Friday’s win. In the bottom of the fourth, the Firebirds were able to get something cooking with some small ball. Lency Delgado started things off with a single to left. He advanced to second on a sac bunt, and later to third on a grounder to second. 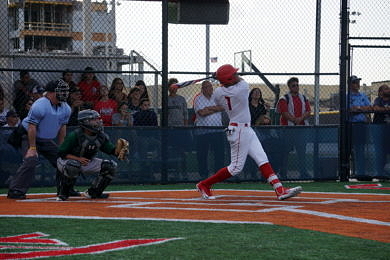 Then, with two outs, senior first baseman Roberto Leiva singled to right to drive in Delgado and give Doral a 1-0 lead. “I was really struggling lately, but I’ve been working with Coach Gronlier and he put me into the zone again, and I’ve gotten hits my last five at-bats,” said Leiva, who went 3-for-3 with two RBIs. The Warriors answered right back in the top half of the fifth. Fairweather led off the inning with a double off the right-center fence. He later scored on a two-out single by shortstop Anthony Villar. Villar advanced to third on a throwing error and later scored on some heads-up base running to give Westminster Christian a 2-1 lead. With the way Fairweather was throwing that seemed like it would be enough for the Warriors (14-7), but then the Firebird bats woke up. Doral pinch-hitter Ivan Zambrano led things off with a single to center. That brought up Delgado, who blasted one over the left field wall to give the Doral a 3-2 lead. 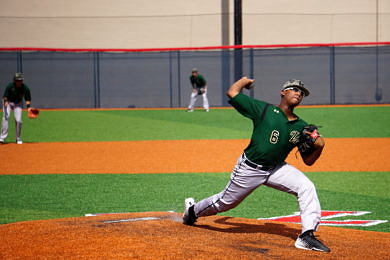 Jamar Fairweather tossed five solid innings. “I was just trying to hit something opposite field, but I was able turn on one and drive it out to left,” Delgado said. The scoring did not stop there. After a walk to Gabriel Gutierrez, Adrian Figueroa doubled to center, bringing in Gutierrez. He then scored on an RBI single by Leiva to make it 5-2. They then loaded the bases and tallied another run, after a hit-by-pitch allowed Leiva to score. The Warriors didn’t go quietly in the seventh. Villar started things with a lead-off double, and Danny Perez made it first-and-third with one out with a single of his own. 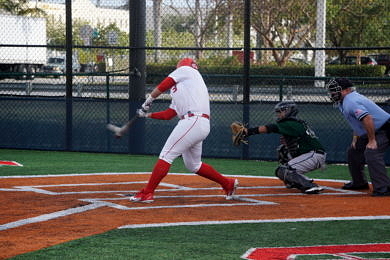 Doral’s Michael Marin was able to settle down and get the next two batters out to end the ball game.